Entry No. 292, Saintpaulia 'Raspberry Sizzle', exhibited by Carolyn Conlin-Lane. Score: 96. First Place. Entry No. 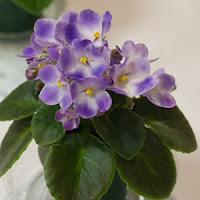 293, Saintpaulia 'Optimara Little Omaha', exhibited by Carolyn Conlin-Lane. Score: 94. Second Place. Entry No. 113, Saintpaulia 'Mac's Luxurious Leisure', exhibited by Lynn Cook and Troy Ray. Score: 75. Third Place.